This Schedule 40 PVC Hose Thread x Pipe Thread Adapter has 3/4" MHT (Male Hose Thread) on one end and MPT (Male Pipe Thread) on the other. 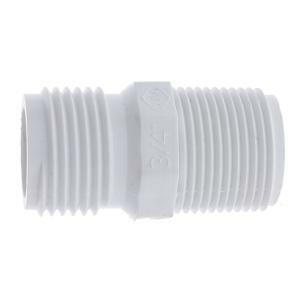 The MHT on this fitting are compatible with standard US garden hose threads. The MPT on this fitting are male national pipe threads.